On a misty damp night here at Langara. The fireplace is on, everyone watched the big game, thank goodness the fishing is okay. Our weather was damp inshore today, offshore on the grounds the weather broke and we had sun and the flattest seas ever, 10 miles off Langara. 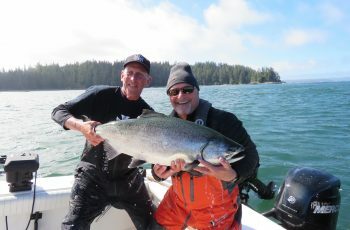 I was fishing with Mark Melkonian and Philip Parnagian and we had a very good go at a tyee out on the west side. 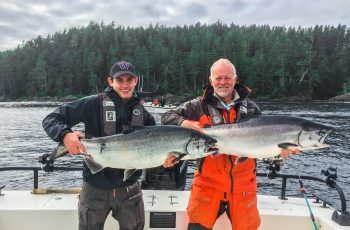 Our first bite did not happen till 815, and the result was a double, a high teen and a 32 lber landed by Mark. 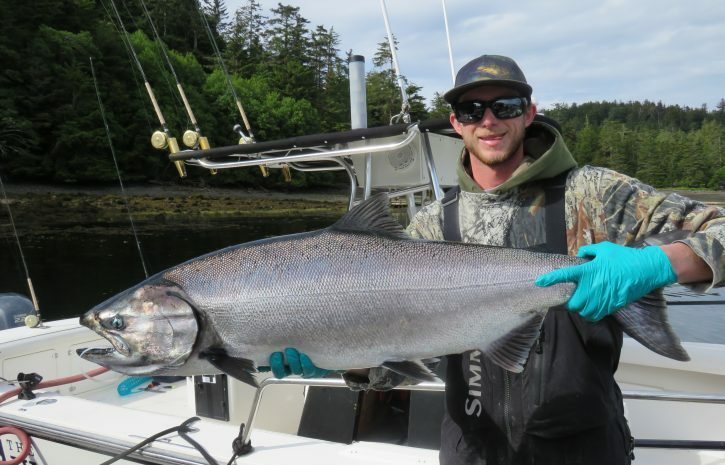 We had a few in the high teens, and a couple chances when Mark hammered another tyee, this time 34 lbs. We were bucking a strong tide in close to the rock, in a cluster of boats when the fish hit, and what a great fight. Several screaming runs as we followed the fish closely as she went with the tide offshore. First pass by the boat we scooped it, a hungry sea lion giving us the stink eye, deciding weather to wolf our fish down. Amazing how fast you can drag a tyee in when a rock dog is bee lining for your monster. Yes a great morning for us in the pouring rain. 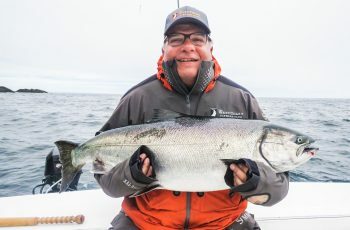 I saw most boats get on them… Kui and his guests, the Shigaki’s, had a tyee, 33 lbs, and I am told Chris and his guests, I think Ivan Curic, released a 40 out there, will get some details. 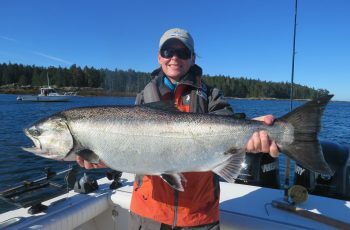 Fishing has slowed, but I saw 22 Chinook retained today, and a bunch of them were 25 to 27 lbs. The afternoon we switched it up and I was talked into halibut fishing, good times. We departed in the rain but no wind, flat calm. By the time we traveled 12 miles we were in sun and it was warm! Matt conman Connelly was first to find them, marking me a spot so ya, pretty good guy. Matt loves his halis, and grabbed his two in near record time. We set up and dropped the pick. I was set up with two new Avet reels, from tackle guru Ken Tsang, what a fantastic piece of equipment. So smooth, guests were instantly impressed, as Philip hooked a 58 lber immediately. I looked to my port and Hans had a 109 lber buckling his rod, finally landing it safely, touch and go at the side of the boat. Not 30 minutes passed and we had another 59 lber, meanwhile Hans and Shawn had they’re second each, both about mid 40’s. Bud cruised in, all done with his guests, Eddie Arakelian and William Halsey, proudly mocking us, Buds fish a 90 and a mid 40’s. Kui grabbed a skate ha ha, a big one. So yes, Con Man put us on the hali today. 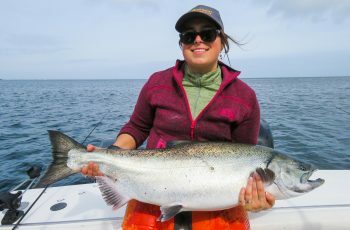 Salmon was slower this afternoon, no fish over 30 lbs, reported. Wow, the dock crew were hard at it this evening, more halibut filleting than I have seen in awhile. That Mona…. Mike is slick with a knife, perfect precision cuts every time. So that is the report for tonight, I have halibut slime to scrub, will be busy cleaning that boat of mine. Check back tomorrow for a full report, thanks for checking in.